Sambar is one of the famous & staple recipe from South-Indian Cuisine. Tindora Sambar | Kovakkai Arachuvitta Sambar is prepared using the freshly grounded masala which adds flavor to the gravy. 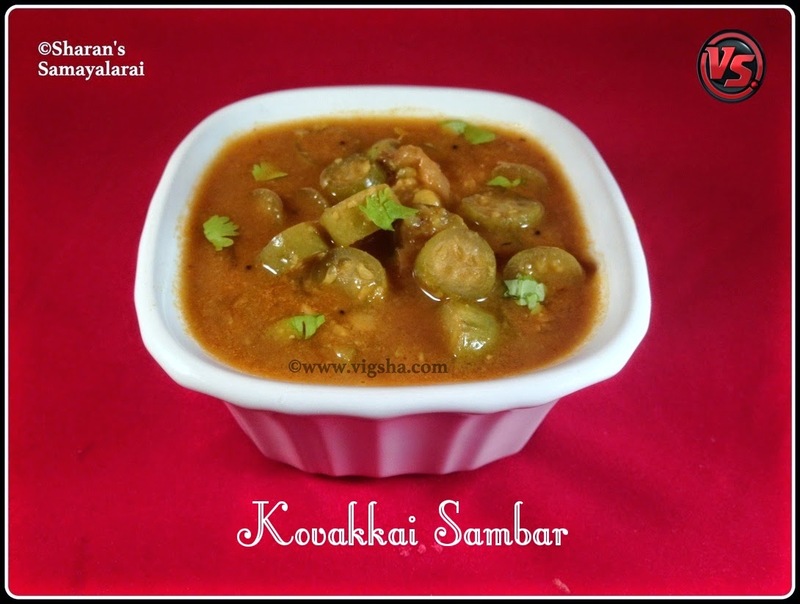 Coming from south, I am trying varieties of sambar and this recipe is one among those. The method is mostly the same with slight variations based on the veggie used. Check out other Sambar Recipes which I have already posted :- Traditional Sambar, Beetroot Sambar, Radish Sambar, Keerai Sambar, Mango Sambar, Tiffin Sambar, Tomato Sambar. Kovakkai/Tindora has a ton of nutritional benefits used widely in traditional Thai and Ayurvedic Medicine. It also helps to regulate the blood sugar levels. Hence this is a good addition to a diabetic meal plan. 1). Wash, cut the tip and tail ends of the kovakkai and chop into thin slices. I personally prefer tender ones than matured kovakkai as it will taste bitter. Matured ones will look green outside but reddish inside. 2). Pressure cook dal with turmeric powder, ¼ tsp castor oil and turmeric powder. Once done, mash and keep aside. Extract tamind juice and keep aside. Grind the ingredients listed under "to grind" and keep aside. 3). Heat ghee/oil in a pan, add mustard and let it splutter. Then add roughly chopped onions, curry leaves along with hing. Saute till they turn translucent. Then add chopped kovakkai along with salt, turmeric powder, chilli powder and sambar powder. 4). Mix the powders along with the veggie and saute for a minute. Add the tamarind extract and mix well. Cook covered till the veggies are half cooked. 5). Then add the grounded paste along with ½ cup of water and mix well. Let the gravy cook till the veggies become soft. 6). Finally add the cooked dal along with water if necessary. Switch off the stove once the sambar boils briskly. Garnish with coriander leaves! 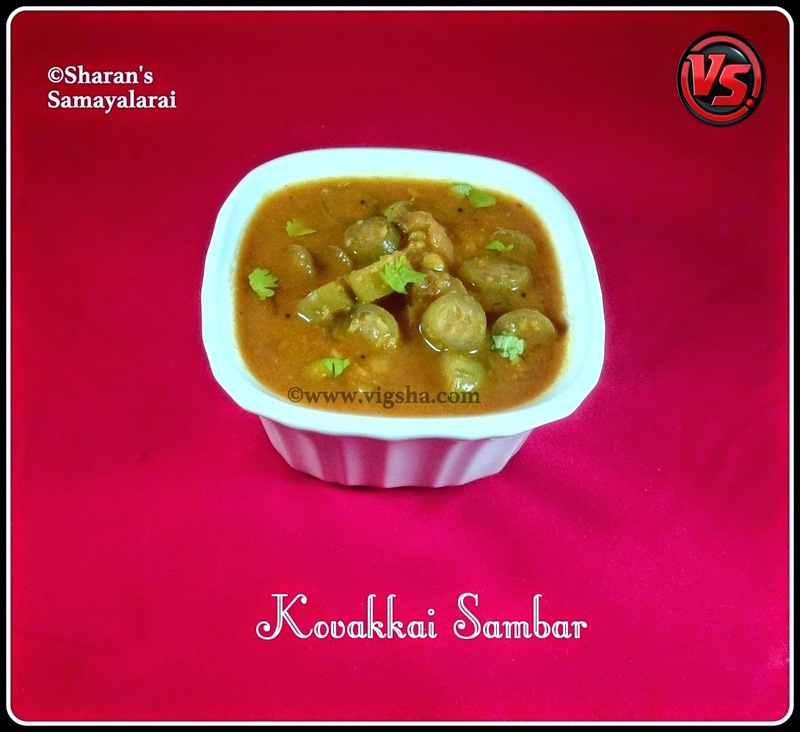 Serve with steamed rice along with Okra (Vendakkai) Poriyal and Peerkangai Thol Thogayal..
# Alternatively you can cut the veggies lenth wise. # Always use shallots for sambar, it adds more flavor to the sambar.